InIdaho offers highly discounted lift tickets as part of ski and stay packages for Sun Valley. Sun Valley is full of world class services and skiing. Since 1936, skiers from all over the world have been saying that Sun Valley is definitely worth the trip. There are two ski mountains located in the Sun Valley area Bald Mountain and Dollar Mountain. Bald Mountain is the main ski mountain in the area and offers 65 varied runs. Offering 13 runs and 628 feet of supportive, nurturing vertical rise, Dollar Mountain is a wonderful mountain for skiers and boarders to learn on. Bald Mountain can be accessed at River Run on the south and Warm Springs on the north. During the winter, finely appointed day lodges, a total of 14 lifts and 65 varied runs await on either side of the mountain. Bald Mountain's seemingly endless runs stretch 2,054 acres to the edges of the Sawtooth National Forest and slide another 3,400 vertical feet, top to bottom. During the summer, the world famous mountain is open to sightseers and adventurers, whether you want a relaxing day among the wildflowers, or a challenging journey through the rugged beauty of Idaho's wilderness. Baldy, as it is affectionately called, offers nearly 28 miles of hiking and biking trails. Feel free to tackle the trails yourself, or take along one of many expert guides to point out all the little things that make the Bald Mountain experience so unique. We do not have any current pre-built packages for Sun Valley Resort . Dollar Mountain lift tickets are not eligible for discounts. Guests of InIdaho.com can order their lift tickets online through Sun Valley Resort. The 20% discount on adult & child lift tickets is valid at Bald Mountain only - Bald Mountain ticket holders can also ski at Dollar Mountain. Season: Usually mid-November to mid-April Bald Mountain Daily Lift Hours: All lifts to the top of the mountain will load guests from 9:00 am to 3:45 pm (MST). All lower lifts will load guests from 9:00 am to 4:00 pm (MST). Access to Seattle Ridge and the bowls closes at 2:45 pm (MST). Dollar Mountain Daily Lift Hours: All lifts will load guests from 9:00 am to 4:00 pm (MST). Sun Valley houses the largest Nordic ski school in the Sun Valley/Sawtooth National Recreation Area. The very latest teaching techniques are incorporated into all levels of instruction, clinics and private lessons. Clinics require a minimum of students. Grooming gives a faster glide and more fun in cross-country skiing. Sun Valley's equipment runs around all the tracks, setting and maintaining a prepared surface for classical and skating lanes daily. 40 kilometers, or about 25 miles of manicured and marked trails begin at the Nordic Center. Gentle terrain at the trailhead progresses to challenging hills. Gliding over glistening meadows at an elevation of 6,000 feet is a unique experience for the Rocky Mountain cross country skier seeking a wide variety of classical, skate skiing and ski touring. Ski touring in the nearby Sawtooth Recreation Area also may be arranged by the Sun Valley Nordic Center. For more information contact the Sun Valley Nordic Center at (208) 622-2250. As America's original ski resort, Sun Valley positioned itself long ago as the place to learn to ski. With the invention of the world's first chairlift in Sun Valley, skiers of all levels flocked to this resort to learn to ski and perfect their technique. Today the tradition continues with a high percentage of expert skiers enrolling in the Sun Valley Ski and Snowboard School, one of the top schools in the country. The excellence of the instruction is unparalleled anywhere in this country. Professional ski instructors even share their technique and play host to instructors from other ski areas. Enhance your skiing performance with today's equipment. The Sun Valley Ski School instructor will help you to understand and learn the latest in ski technology, "carving shaped skis." Whether your a beginner or an expert skier, our instructors know how to help you have fun, build confidence and develop skills in a setting that seems like "child's play." For more information on clinics, group or private lessons, contact 208-622-2248. Enjoy a magical evening under the stars at the World class Sun Valley Ice Show. Ice shows begin at dusk mid-June through mid-September on a beautiful 180' X 90' outdoor ice rink. Prepare your senses for a magical evening of music, lights, the sound of blades cutting across the ice, gorgeous costumes, sweet smelling mountain air, the stars in the sky and most of all the stars on the ice. Our Saturday night Ice Shows showcase current and past gold medalists like Tara Lipinski, Ilia Kulik, Katarina Witt, Scott Hamilton and Brian Boitano to name a few. Best of all you can enjoy all the excitement right at your table, with terrace-buffet seating just rows from the ice rink. Reserved bleacher seating is available without the buffet. For Ice Show schedules and to purchase tickets please call (208) 622-2135. Built in 1937, the Sun Valley outdoor year-round rink is the home of the world famous Sun Valley Ice Shows. Saturday evenings provide the unique opportunity to view an incredible exhibition of Olympic and World-class talent as the Sun Valley Ice Show takes the stage from mid-June through mid-September. Stroll through the Sun Valley Lodge Lobby to the terrace and watch the skaters twirl around the rink. Rent a pair of skates and rub elbows with Olympic and World-class skaters practicing their routines. Professional skater and Olympic Silver Medalist, Linda Fratianne heads an excellent staff of skating professionals for group and private lessons. The Sun Valley Skating Center, under the direction of Cory Lovoi, offers: A beautiful 180' by 90' outdoor rink with spectacular views of the Sawtooth Mountain Range An adjoining Olympic size indoor rink equipped with a ballet studio and jumping harness High-altitude training Over 10 different clinics Up to 30 sessions a day A full service Pro Shop Contact the Skating Center for more information at (208) 622-2294. There are several different avenues for getting to Sun Valley. If you are flying, the most popular options are either into Friedman Memorial Airport (SUN) in Hailey, about 11 miles from Ketchum or Boise International Airport (BOI) in Boise, about 150 miles west of Ketchum. If you are driving to Sun Valley, please refer to the driving directions listed below. If you are arriving at Friedman Memorial Airport (SUN) you will most likely take a taxi to your destination, unless an airport shuttle is provided through your accommodations. A couple of taxi options are A-1 Taxi Cab and the Sun Valley Chauffer. If you'd like a rental car Avis Rent-a-Car is located in the Friedman Memorial Airport. If you are arriving at Boise International Airport (BOI) you have a couple of options to get to Sun Valley. Charter flights from Boise to Sun Valley are available through Access Air. Also, the Sun Valley Express offers a daily shuttle service during the on-season and runs more than once daily during the peak seasons. If you'd prefer renting a car and driving to Sun Valley, Avis Rent-a-Car is located in Boise Airport and also has an office at the Friedman Memorial Airport. If you are driving from Boise, refer to driving directions below. Driving Directions From Boise Airport (BOI) to Ketchum/Sun Valley (approx. 150 miles): 1. Take I-84 East toward Mountain Home. 2. Take Exit 95 to US-20 toward Mountain Home/Fairfield. 3. Turn left onto ID-51/US-20/American Legion Blvd. 4. Continue to follow US-20 approx. 82 miles. 5. Turn left onto ID-75. 6. Follow ID-75 approx. 25 miles into Ketchum, where ID-75 becomes Main Street. From Salt Lake City, Utah (approx. 295 miles): 1. Take 1-15 North approx. 71 miles 2. Continue onto I-84 W approx. 95 miles 3. Exit on ramp to I-84 W (US-30 W) 4. Continue on I-84 W (US-30 W) approx. 48 miles 5. Bear right onto off-ramp at exit 173 to US-93 N 6. Turn right onto US-93 N approx. 20 miles 7. Continue onto ID-75 (Greenwood St) 8. Continue on ID-75 approx. 54 miles into Ketchum, where ID-75 becomes Main Street From Stanley, Idaho (approx. 61 miles): 1. From ID-21 turn south on ID-75. 2. Continue on ID-75 approx. 61 miles into Ketchum, where ID-75 becomes Main Street. Changed your mind? Exchange your ticket. Want to take a break from the slopes? We're good with that. Buy a multiday (3 or more days) adult lift ticket and exchange one day for a variety of other ways to make your Sun Valley visit memorable. Exchange program is available all 2018-19 winter season except for the Holiday blackout dates (12/22/18 - 1/1/19). Nordic Package: Cross-country trail day pass and complete equipment rental package at the Sun Valley Nordic & Snowshoe Center. Ski or Snowboard Group Clinic: $40 off one four-hour, adults-only group ski or snowboard clinic. Ice Skating Package with Lunch: One general session of ice skating, skate rental at the outdoor ice rink, and $20 off lunch at Gretchen's Restaurant in the Sun Valley Lodge. Alcohol and gratuity not included. Sunday Brunch in the Lodge Dining Room: $40 off Sunday buffet brunch for two at the elegant Lodge Dining Room, located on the second floor of the Sun Valley Lodge. Dinner and Entertainment Package #1: $40 off dinner at The Ram Restaurant and a complimentary show at the Boiler Room, both located in the Sun Valley Village. Boiler Room show dates and entertainers vary weekly. Alcohol and gratuity not included. Dinner and Entertainment Package #2: $40 off dinner at Gretchen's Restaurant and a complimentary show at the Boiler Room, both located in the Sun Valley Village. Boiler Room show dates and entertainers vary weekly. Alcohol and gratuity not included. Massage: Relaxing half-hour massage at the Sun Valley Salon & Day Spa, located in the Sun Valley Lodge. Advance reservations required. Sun Valley Heli Skiing: Experience the exhilarating thrill of helicopter backcountry skiing with Sun Valley Heli-Skiing. Exchange your lift ticket and get $40 off the day rate. For reservations and details, call 208.622.3108. Village Shopping: $40 off your purchase at one of the following Village shops: Pete Lane's Mountain Sports, Brass Ranch, Sun Valley Signature Gift Shop. Sun Valley is located about 150 miles east of Boise. The Sun Valley area consists of basically four different neighborhoods; Ketchum & River Run, Warm Springs, Sun Valley Village and Elkhorn. This section is designed to help you understand their relationship to each other and explain each area in a little more detail. Ketchum/River Run: top Ketchum is the main town in the Sun Valley area. It is located about one and a half miles southwest of the Sun Valley Village. In downtown Ketchum, there are many lodging options along with over 80 restaurants and several shops. About seven to ten blocks to the west of downtown Ketchum, is the eastern base area of Bald Mountain. The area surrounding the eastern base of the mountain is referred to as River Run, basically a sub-area of Ketchum, and there are several lodging options located in this area. Warm Springs: top The other base area of Bald Mountain is Warm Springs. Located on the northern side of Bald Mountain, Warm Springs is about two miles northwest of downtown Ketchum. The Warm Springs area has a lot of condominium and home options available. In general, the lodging accommodations in Warm Springs are closer to the lifts than in River Run. In the winter, Warm Springs provides restaurants and nightlife and in the summer it is a quiet place to stay. Sun Valley Village: top The Sun Valley Village is located northeast of downtown Ketchum and is home of the well-known Sun Valley Lodge and Inn. The Village offers several restaurants and a pedestrian village with a good selection of shopping options. There are also seven different condominium complexes within the Sun Valley Village. There are several different amenities offered in the Sun Valley Village including; outdoor heated pools, fitness centers, ice skating, sleigh rides, tennis courts, a bowling alley, salon, day spa, gun club, movie & opera house, stables and a Nordic & Snowshoe center. Also located within the Sun Valley Village is Dollar Mountain, a ski mountain for beginners. Elkhorn: top The bedroom community of Elkhorn is located approximately two miles east of downtown Ketchum and just a little south of the Sun Valley Village. 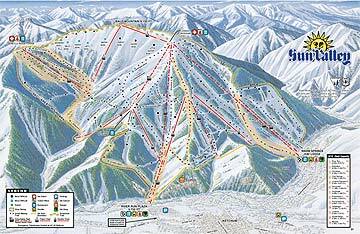 Elkhorn is also conveniently located near Dollar Mountain, the ski mountain for beginners located in Sun Valley. The area offers a golf course and access to a seasonal pool and hot tub, along with tennis courts. Currently there are not any restaurants or shops available in Elkhorn. Lodging options are mainly in condos and homes and are normally a little more affordable in the winter than any of the other neighborhoods in the Sun Valley area. Depending on the location in Elkhorn, it is normally between a two and a half mile to five mile drive to the River Run area of Bald Mountain. It is not always necessary to have a rental car when staying in the Sun Valley area. The KART (Ketchum Area Rapid Transit) provides service through all four neighborhoods on a regular basis and is a free shuttle system. In the summer play a round at the Sun Valley Golf Course. This Robert Trent Jr. course is ranked among the top in Idaho. Please note: Guest reviews may mention certain amenities that may no longer be offered with Sun Valley Resort. Please check the amenities prior to booking to confirm. "I rode the Bald Mountain gondola as a foot passenger to enjoy a lunch reservation at the Round House Restaurant at 7,700 ft. on the mountain. It was a beautiful day and the views from the Roundhouse were beautiful, although I had been hoping for more snow. This was a dry year, but most of the ski lifts were running. The food at the Round House was very good, but I thought the price was a little high. The service was good and the drinks at the cozy bar were worth the wait for the restaurant. Be sure to make a reservation as this is a very busy place." "This is a revue of the Spa at Sun Valley Lodge. I made direct reservations with the spa, the week prior to arriving at my conference at the Sun Valley inn. The spa is well laid out and nice and quiet. I had a massage, facial and manicure over 2 days and I luxuriated in the attention. I thought the prices were fair and comparable to prices at other nice resorts. There is also a very nice heated, outdoor pool attached to the spa facility. Any guest is welcome to use the pool. The Spa is getting ready for a renovation and the services will move to a new facility for the coming months. All services will be available." Cancellation Policy**:(May vary with special rates, packages & online bookings) Discounted lift tickets are only available in conjunction with lodging from InIdaho.com. Lift tickets are non-refundable 15 days prior to arrival. Multi-day tickets are interchangeable for other activities, except for the Holiday blackout dates (12/22/18 - 1/1/19).